Publisher of "We're in the Mountains Not over the Hill--Tales and Tips from Seasoned Women Backpackers." If you would like me to remove your name from the newsletter e-mail list, please let me know. If you know anyone who wants to be added, please have them send me a message. Thanks. Please note: There will not be a May issue—time to regroup! In the meantime, please continue to send in items of interest to the hiking (including Camino) and backpacking communities. Send to: backpack45 (at sign) yahoo.com. Thank you! 7. 2020 Camino Gathering at Tahoe! #2. Passports and Pilgrim Passports. On the Camino forum, the question was asked if pilgrims arriving at albergues need to show their U.S. passport as well as their Pilgrim passport. The answer is “yes.” This applies not only at albergues, but at all lodgings in the European Union. They are required to collect information on guests including name and nationality. This is to enable law enforcement to cross-check for wanted individuals, criminals, or missing persons. In Spain, for example, you are required to carry identification at all times, but the police will accept a color copy of your passport. I also recommend that you bring a second form of ID, such as your driver’s license, with you. And as an aside, we have occasionally been asked to leave our passport with the front desk to be returned to us later. Unnerving as this is, it is not unusual, so the copy comes in handy for this also. Not sure how comfortable or practical the shoes hint is, and it seems to me that it would take a whole lot of tape to make a stretcher, but I can see it working! #5. Purple Rain skirts and kilts: I learned about Purple Rain skirts last year at the RUCK, a hiker’s gathering put on by the ALDHA-West association. Very informal and very informative. I have since learned that “founder Mandy ‘Purple Rain’ Bland got the idea for hiking skirts and kilts while thru hiking first the AT and then the PCT. She made her first prototype by hacking up an old pair of hiking pants. While her design has been significantly refined over the years, our desire to help others experience the lessons from the trail has remained unaltered. I don’t get any goods or services for mentioning the above—I just like the idea of supporting gear startups that offer quality products. #7. 2020 Camino Gathering in Lake Tahoe, California! Mark your calendars for next year’s American Pilgrims on the Camino annual Gathering of Pilgrims. Scheduled for March 12 through 15, 2020. Theme is “Honoring the Past… Welcoming the Future” to be held at the Zephyr Point Conference Center, Zephyr Cove, Lake Tahoe, California. There will also be a hospitalero training before the gathering. In 2015-16, Susan and Ralph Alcorn hiked the Camino Norte and the Camino Primitivo, two of the less-traveled routes of the Camino de Santiago. Susan is the author of several books, including Healing Miles: Gifts from the Caminos Norte and Primitivo. Ralph and Susan have also hiked the Pacific Crest Trail, the John Muir Trail, and the Torres del Paine in Patagonia, and they share hiking advice on their website. #9. Norwegian Air changes at Bay Area airports. Many of us were very happy when Norwegian provided service to London’s Gatwick Airport (LGW) out of Oakland Airport because Oakland Airport was smaller and parking was a lot easier (and it was an easier commute for some of us.) However, Norwegian has switched airports for the five weekly non-stop flights that left from Oakland. The Norwegian Air 787 Dreamliners are now flying out of SFO on Mondays, Tuesdays, Thursdays, Fridays and Sundays. (You might check to see if they are still offering travelers enticing $500 fares). Note: These changes do not affect other destinations out of Oakland such as Barcelona and Paris. https://www.berkeleypaths.org/ for more local walks. #11. Join a Camino group: I encourage you to join the national Pilgrim Group and the Peregrinos Northern California group. For the website of the national group, American Pilgrims, click here. The various regional chapters are listed on the APOC site and their activities are published there. Our Northern California chapter also has a Facebook group (closed group), called Peregrinos - Northern California, which has timely information on our chapter’s events and news. #1.Acclimate to elevation: Though thousands hike all or part of the John Muir Trail (JMT) each year, it’s a challenge not to be taken lightly. One of the considerations is elevation. As the attached article mentions, after Donahue Pass (near the starting point of the northern end and with 80% of the JMT remaining) the average elevation of the trail is more than 10,000 feet. What makes the article unique is that it is focused on the JMT rather than mountain hiking in general and that the authors have laid out some sample itineraries for acclimating to the high altitudes. Learn from those who have studied the matter, and have a successful and safe hike! https://unofficialacclimatizationguideline.blogspot.com/ (photo: Ralph Alcorn. 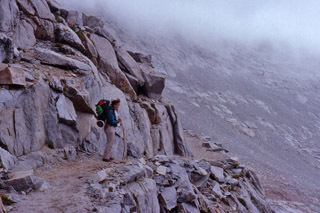 "Susan on Forester Pass" 1989). #3. Hikers’ Umbrellas. A Six Moon Designs notice of their new line of Ultralight Trail Umbrellas. “Each model has the same silver reflective coating with 50+ UPF rating providing the ultimate in protection from sun, rain and snow while hiking and backpacking. The Silver Shadow collection consists of three models: the Silver Shadow, the Silver Shadow Mini, and the Silver Shadow Carbon. "The SilverShadowCarbon is the original work horse of the group, featuring a 24” fiberglass shaft and plastic ribs, spreader and runner. Canopy: 37”. Weight: 8.9 oz. MSRP $25. The Silver Shadow Mini is collapsible and foldable, making it the perfect travel companion. Total length when closed is 10" and when extended is 20.5”. Carbon fiber ribs are used to increase strength and save weight. Canopy 37.75”. Weight: 6.8 oz. MSRP $35. The Silver Shadow Carbon is based on the original Silver Shadow but features all carbon fiber components including the 24” shaft, ribs and spreader bars, making this the lightest full-size trekking umbrella on the market. This umbrella will be especially appealing with ultralight gram counters. Canopy 37”. Weight 6.8 oz. MSRP $45. Six Moon Designs was created by PCT hiker “Ron Moak, an avid thru-hiker who sought out much lighter weight gear than what was available at the time.” He introduced his first product the Europa Tent, a 33oz. single wall silnylon shelter in 2002. Six Moon Designs continues to be on the cutting edge of ultralight innovation and strives to make quality ultralight tents, shelters, backpacks and other accessories designed to get more people outdoors. #4. Israel National Trail. Here’s a new long-distance trail for you to try. Scott Williams is on it now and you can follow his trek at https://shroomerhikes.wordpress.com/ Of the Israel Ntl. Trail, Wiki says, "The Israel National Trail, (Hebrew: שביל ישראל‎, Shvil Yisra'el) is a hiking path that was inaugurated in 1995. The trail crosses the entire country of Israel. Its northern end is at Dan, near the Lebanese border in the far north of the country, and it extends to Eilat at the southernmost tip of Israel on the Red Sea, a length of 1,015 km (631 mi)." Scott Williams (Shroomer) is a Triple Crown hiker who has also hiked the Camino Frances and the challenging Te Araroa Trail in New Zealand. Wikipedia says, "Te Araroa (The Long Pathway) is New Zealand's long distance tramping route, stretching circa 3,000 kilometres (1,900 mi) along the length of the country's two main islands from Cape Reinga to Bluff. ... Tramping the full length of the trail generally takes three to six months." #5. Yosemite’s Grandeur: An excellent program, which aired late February, is available online, click here. “…the endurance of sequoias, John Dittli talking about receding snow levels, the reintroduction of Big Horn sheep, the pikas and the numerous coyotes to be found throughout the high country.” Shared from JMT Forum by contributor CharliePoleCat. Click here. Link expires 3/27/2019. #6. Happy to have good news about the environment! Congress approved the Land and Water Conservation Fund renewal. The Trail Dirt Newsletter from the Pacific Crest Trail Association sent word. "Congress passed a historic package of public lands bills this week that, among other things, reauthorizes the Land and Water Conservation Fund (LWCF) and protects nearly 2.5 million acres of public land and 676 miles of rivers throughout the U.S. The PCTA has been fighting for permanent LWCF renewal for years. In 2015, Congress reauthorized this important conservation tool for three years. It expired again last September. The fund provides money for land conservation projects and is crucial to our effort to protect the last 10 percent of the PCT that remains on private property. On Tuesday, the House passed the bill 363-62 and the Senate passed it two weeks ago 92-8. It now awaits the President’s signature. Thanks to all of you who participated in our advocacy efforts by contacting your elected representatives. You voices most certainly made a difference." (Feb 28, 2019). #7. Regional: Seattle Area: Sunday, March 3.: Mary Davison, Triple Crown Recipient in 2018 is giving a presentation in the Seattle/Lynnood area. “I will be giving a presentation on my journey of the Triple Crown this Sunday at Trinity Lutheran Church in Lynnwood, Washington, 6215 196th St SW. It is a potluck starting at 11:45 and ending approximately at 2:00. I will have pictures taken over the AT, PCT, CDT. Probably be plenty of food there even if you bring none. All are welcome.” Mary has completed all three of the Triple Crown trails and written about them in her new book, Old Lady on the Trail:Triple Crown at 76. #8. Regional: S.F. Bay Area and Sacramento: Tom Courtney brings you a program introducing you to his new edition of “Walkabout Northern California: Hiking Inn to Inn has arrived! It includes new hikes from inn-to-inn and updates on trails, inns, and restaurants. There are fourteen walkabouts.” March 12, REI Roseville; March 13, REI Sacramento; March 26, REI Berkeley; and March 27, REI San Carlos. All programs run 7 PM- 8:30 PM. Events are free, but reservations are recommended. "This new, full-color edition of Walkabout Northern California: Hiking Inn to Inn includes new hikes (walkabouts) plus updated trails, restaurants, and inns. It describes fourteen multiday hikes along the wild Pacific Coast, through the majestic Sierra Nevada Mountains, in the Cascades, and around the parklands of the San Francisco Bay. Each walkabout is organized by chapter and contains all the necessary details to create a memorable and invigorating vacation—with a map, mile-by-mile details of the route, logistical tips on places to stay and eat, and inspirational ideas to simplify your travel and reconnect with nature’s rhythm. Some hikes can take a week, but many can be enjoyed in a weekend. Some are challenging, but most are perfect for the casual hiker. With a light daypack and a few reservations, you can travel for days along California’s breathtaking coastline or in its vast mountain ranges. Follow Tom Courtney on a Northern California walkabout, so you can savor the journey and the destination. (photo by Susan Alcorn: Lassen's other-worldly hydrothermal activity). #9. Regional: SF Bay Area. Dami Roelse comes to the S.F. Bay Area with a topic relevant to those of us who want to keep hiking as we age. Roelse is a certified life coach, writer and retired mental health provider. Born in Holland now living in Southern Oregon, Dami has traveled the world extensively, lived on different continents and has learned to use her hiking and travel as inspiration for living. Dami presents facts and stories about walking and hiking for women as they age from her book Walking Gone Wild, How to lose your age on the trail. Dami will share ways to build and maintain strength in everyday life. She’ll give you tips for being safe in the outdoors, and how to choose your lightweight gear. Even though the talk is geared to women 50+, all women and men can benefit from Dami's experience. "She is a regular contributor for Sixty and Me and The Trek magazine. You can follow Dami on her website, Facebook page WalkingWomen50plus, Twitter @dami97520 and Instagram @walkingwoman50plus. Happy Trails and Travels as well at Happy St. Paddy's Day! Regional: S.F. Bay Area. Ticks are definitely out there! #1. Mushrooms! Triple-crown recipient Shroomer, known to many of those in the real world as Scott Williams, wrote such an intriguing piece on mushrooms in one of his recent emails that I just had to get permission to share it with you! The place names, and trails, may be unfamiliar to those of you who don’t live in the S.F. Bay Area, but his article is so informative and beautifully written that I know you’ll enjoy reading it. “The year is turning, the longest night is behind us, and looking out on the brilliant blue California sky this morning, I’m reminded of just how blessed we are to live in a place in which some of the best weather of the year for outdoor activities is all winter long. The hills are a Bay Area Christmas green, and our mycelial friends are beginning to fruit. The unusually dry fall has set everything back by about a month, but they’re finally here. “Agaricus Californicus, one of the only close relatives of the portobello capable of giving you a stomach ache, was coming up in large numbers, bright white against the black duff of the forests near Stinson. Further up trail, oyster mushrooms covered the trunks of a few oaks, shelving, pale grey, as high as these poor damaged trees still stood. A parasite, oysters will eventually kill those trees, but in the meantime, they’re beautiful and delicious! Never throw the scraps of this one in your compost pile though, as even the cultivated varieties are capable of doing damage to the hardwoods and perennials in your garden if they get spread around. “Further still, just above Muir Woods, were amanita caliptrata, the coccoli, big as dinner plates and just opened. They are a delicious edible, but so closely related, both genetically and in physical features, to the amanita phaloides, the death cap, that it is the confusion of one for the other that is responsible for probably 95% of all fatal mushroom poisonings in this country. “Close by was brilliantly colorful, amanita mascaria, the magic mushroom of shamanic traditions worldwide, its bright red top dotted all over with white specks. It’s one of the most beautiful mushrooms in the world, and is the classic toadstool of fairy tales and legends. It is poisonous, but when eaten in just the right amount, will bring on a hallucinogenic state, if it doesn’t kill you in the meantime. It is the mushroom that the Viking Berserkers used before battle, and is still used by the shamanic peoples of the tundra and taiga from Russia all across the top of the world to Canada and the U.S. Most recently its symbols and signs have been found in chambers under Rome, believed to have been used by the Caesars when participating in the rites of the Roman mushroom cult, part of the religious practices of Imperial Rome. “And where do we see this mushroom today? Take a look at Santa. His bright red and white hat falling to one side is the cap that has been depicted on the God of this mushroom cult for millennia. And yes, there is a historic link between this early European/Middle Eastern cult and some of today’s Christmas practices. “But finally, just across the trail from these dazzling red caps, was a lone porcini. Most prized of our West Coast funguses, I’ve at times found them at over 4 pounds of deliciousness. This one came in at just over a pound, and added immeasurably to a large Christmas morning, scrambled eggs breakfast for all our household guests. #2. Nifty Ninety takes us to Lick Observatory. Last week, we and our friends Patricia and Tom were itching to bag another peak for the #NiftyNinetyPeak challenge that we are all doing; we decided to go to a very special place—Lick Observatory on Mount Hamilton. Storms were sweeping through the S.F. Bay Area, but it looked like we might have a bit of a break. We left our home mid-morning under a gray sky. I had visions of the mountain being completely shrouded in dense fog. At least weather forecasts had not predicted snow--at 4,213 feet this would not be unusual and if it had snowed, the 10-mile, narrow, curvy road to the mountain top would have to be closed. We drove to San Jose and began the long and slow drive (an hour each way), but no one minded because the hills were brilliant green and many trees were budding or blossoming. Still when we reached our destination, I was sorry that we were in the clouds. We went inside the stately marble hall of the visitors’ center and began to look through the exhibits and photographs in the multiple rooms. It’s not every day that we happen to view 200-pound meteorites, see photos of the rock shelter atop Mt. Whitney and learn of Lick Observatory’s role in creating this landmark (the then-director designed it), and can learn how various kinds of telescopes work. As it happened, we were the only visitors at the time, and the volunteer in the gift shop offered to start a guided tour immediately. We were taken into the room that houses the Great Lick Refractor Telescope—the first of the mountain top site’s several telescopes. When first opened in 1888, the 36-inch refractor scope was the largest of its kind. It is used nowadays only for educational purposes, and we were excited that we were able to view and learn more about it. Next, we went to the building that houses the Shane 120-inch reflector telescope to admire it and watch some of the interesting films about how it was constructed and so forth. When we came out of the buildings, the fog had cleared and we had spectacular views. There is much more I could share about what is there to be seen on the mountain top, but that’s for another time. Suffice it to say—the mountaintop has much to offer its visitors (and residents). Even my not-very-knowledgeable brain on such scientific matters managed to gain a little understanding from this trek. #3. Everest Base Camp: Eddie Frank, founder and owner of Tusker Trails writes, “A trek to Everest Base Camp is perfect for first-time trekkers. It’s an incredible way to get the taste for adventure. Here’s how you make it happen. Link here. “Tusker runs an 18-day trek to Everest Base Camp in April and October. The trip requires you to hike between Lukla (9,400 feet) to Everest Base Camp at 17,585 but you will go as high as 18,513 feet on the journey. "You will be on your feet 12 solid days on varying terrain covering 75 miles and will trek alongside well trained Tusker guides who monitor your health daily to make sure you are acclimatizing and staying healthy. Altitude sickness is your biggest issue, but Tusker’s team is highly trained in proven techniques to both monitor and treat any altitude emergencies. Tusker also brings its own chef and hygiene systems along to insure you don’t get food poisoning which is a major concern in the Nepal backcountry." While I haven’t been on this trek (sure wish I could! ), we had a wonderful experience doing the Kilimanjaro trip with this company. We felt they did an excellent job with the planning, guiding, safety measures, and food. The first block of rooms filled quickly, if you want to get a room in the newly opened site, act quickly! #5. Camino: Ribadiso Welcome Service. An alternate way to volunteer is offered by “Ribadiso Team.” “…join the 2019 Ribadiso Welcome Service and have not yet submitted your application, don't delay! Completed applications are due no later than Wednesday, February 20. Request an application at ribadiso@americanpilgrims.org “…volunteering at the historic albergue at Ribadiso is offered to members of American Pilgrims on the Camino by the Galician government once again this year. Ribadiso is located on the Camino Francés about 40 kilometers before Santiago de Compostela in the verdant Galician countryside. This small village includes the public albergue, a private albergue, a pilgrim pensión, a bar where pilgrims can eat next to the public albergue and another two bars that also serve food a short walk away. They do NOT “clean the albergue, register pilgrims, collect fees, cook for pilgrims, hold prayer services or other spiritual get-togethers. Volunteers are not in charge of the albergue but rather offer their services in collaboration with the paid staff.” Because of the way albergues are managed in Galicia, volunteers have a fair amount of free time to engage with the local population, explore or work on their own projects—primarily in the morning before the albergue opens at 1 p.m.
“The albergue, originally a 15th century pilgrim hospital, is located on the banks of the River Iso and is widely considered to be one of the most beautiful albergues on the entire Camino. It has 60 beds, plus 4 additional beds reserved for handicapped pilgrims and a large camping area for pilgrims who carry their own tents. The albergue has ample bathroom and shower facilities, plus coin-operated washers and dryers and abundant clotheslines. Ribadiso is part of the network of albergues in Galicia, all of which are operated by the Xacobeo, the regional government agency in charge of Camino matters in that region. Unlike albergues in most other parts of the country, the Xacobeo contracts with local people who register pilgrims, accept their fees and clean the albergue. “Expenses for travel to/from Ribadiso, food and incidentals while you are there are your responsibility. American Pilgrims on the Camino provides a $100 stipend to each team to cover the cost of hard candy, water cups and clothespins that we ask volunteers to make available for pilgrims. There is no shop or market in Ribadiso, but supplies and groceries can be purchased in Arzúa, which is 3 kilometers away. “Volunteer accommodation is in a comfortable, well-furnished two-bedroom apartment at the albergue. The apartment has its own kitchen and bathroom, a sitting area and a dining table. Only volunteers in the program may stay in the apartment and only during their time of service. #6. Regional: S.F. Bay Area. Dami Roelse is a certified life coach, writer and retired mental health provider. Born in Holland, she has traveled the world extensively, lived on different continents and has learned to use her hiking and travel as inspiration for living. Dami presents facts and stories about walking and hiking for women as they age from her book "Walking Gone Wild, How to lose your age on the trail". Dami will be in the Bay Area in March and will cover such topics as how to build and maintain strength in everyday life, how to be being safe in the outdoors, and how to choose your lightweight gear. “Even though the talk is geared to women 50+, all women and men can benefit from Dami's experience. She is a regular contributor for Sixty and Me and The Trek magazine. You can follow Dami on her website, her Facebook page WalkingWomen50plus, Twitter @dami97520 and Instagram @walkingwoman50plus. Dami also hosts a Facebook group for women 50+ interested in walking, hiking and backpacking. Transformation Travel will be given: Tue, Mar 5, San Francisco REI. 7:00pm - 8:30pm; Wed., March 6. Corte Madera REI, 213 Corte Madera Town Ctr, CA 94925, 7:00pm - 8:30pm; and Thu, Mar 7. Berkeley REI. 7:00pm - 8:30pm. #7. S.F. Bay Area Regional: Lyme Disease in the Oakland Hills. Received this warning on our local Nextdoor from Stan Dodson, who is part of the Oakland Volunteer Park Patrol. stan@oaklandtrails.org. (1/8/2019). “Lyme Disease is very rare in these parts, but this is a good reminder for all of us who enjoy the trails. The rain has brought a plethora of ticks out in our woods. For the first time in my adult life, I was bitten by a tick about 10 days ago (Joaquin Miller Park, Castle/Bayview trail). I extracted it within hours and after a couple of days of redness it was a thing of the past. Then yesterday a very large and itchy bull’s-eye rash appeared at the site of the bite. "I just had a Lyme disease diagnosis confirmed. I’m very lucky that I saw the bite, got the tick out quickly, and had the rash that doesn’t always appear — that allowed me to seek immediate treatment. I will be on antibiotics for 21 days and will be fine. I’m posting this because many people are not aware that Lyme disease is in the ticks in our woods. It’s really important to seek treatment if any of these symptoms appear. Untreated, Lyme disease can be incredibly debilitating and a lifelong ailment. And, unlike me, when you extract the tick put it in a baggie or Tupperware and freeze it. That tick can be tested for Lyme disease if needed. My visible rash negated the need for me to do that, thankfully. " Susan Alcorn’s Backpacking & Hiking Tales and Tips #238 January 2019. Happy New Year! 1. #1. The Pacific Crest Trail Association has an article on how to get to trailheads along the trail. Especially helpful if you are a section-hiker that needs to reenter or leave the trail between hike. Reaching the PCT Trailheads. #2. The American Long Distance Hiking Association & the upcoming Rucks. The ALDHA-West has announced its upcoming Rucks. First is the NorCal Ruck, January 26, 2019, Oakland, CA. Following are the Cascades Ruck, February 23, 2019, Stevenson, WA (new venue just across the river from Cascade Locks! ); Rockies Ruck, March 9, 2019, Golden, CO; Bellingham Ruck, March 23, 2019; Bellingham, WA; Inland NW Ruck, April 6,2019, Coeur d'Alene, ID. The Rucks take place in informal and relaxed settings with presenters providing very helpful information to participants. Hikers--whether newbies or experienced--will enjoy the camaraderie and reunions. The handful (not overwhelming you with their number!) of vendors offer innovative and practical camping gear, clothing, books and so forth. The Ruck teams says, “we will have some new topics as well as a new format this year to include more breakout sessions, allowing for a more interactive and individualized experience!" and they’ll be talking about such topics as: Lightweight gear and hiking styles, How Not to Die, Women's specific, LNT and Trail Town Etiquette, and Reentry. The Pack Shakedown is interesting—experienced backpackers delve into newbies packs and make suggestions on where to cut pack weight and other practical advice. Follow this link to Ruck info. If you're not already a member of ALDHA-West, now is a great time to join; when you join you'll immediately become eligible to register for the Rucks at the member rate. Info on joining here. #4. Treeline Review. Scott Williams, Shroomer, alerted me to the new Treeline Review, a blog by Liz Thomas “Snorkel” and an amazing group of outdoors writers and long distance hikers. The site, which reviews hiking, backpacking, and other outdoor clothing and gear, wades through the tons of material out there on zillions of sites and condenses it to create an “aggregated review process.” Currently at the top of the page are reviews on the “best tough cameras,” a folding Oru Kayak, and rain jackets (especially valuable this time of year!). Find Treeline Review site here. You can also follow them on Facebook at https://www.facebook.com/TreelineReview/ where you’ll find many reviews and also current information about how our planet is faring. #5. Climber Arlene Blum enters the California’s Hall of Fame. Adventurer and scientist Arlene Blum, PhD has been inducted to the state’s hall of fame. At the Dec. 4 ceremony, Blum and other Californian of importance who have been honored this year by Governor Jerry Brown—Thomas Keller, Fernando Valenzuela, Joan Baez, Robert Redford, Nancy McFadden, Belva Davidson and late Mayor Ed Lee joined the elite group of previous honorees. “Arlene Blum led the first American — and all-women’s — ascent of Annapurna I, one of the world’s most dangerous and difficult mountains.” When I read her first book, Annapurna: A Woman’s Place, I was enthralled. I knew her by reputation, but seeing her in person, as I did when I went to see a talk she gave as part of a UC Berkeley Travel series, I was amazed. She challenged my preconceptions (at the time) of a mountain climber—she was fit, but not tall and lanky. She was modest and humble, not a braggart. I became a real admirer. #6. Let’s talk worms! In the Winter issue of Bay Nature (a beautiful magazine by the way) there is a very informative article about earthworms. For one thing, you may think that worms being hermaphrodites (having both male and female parts) can fertilize themselves, but that’s not quite how it all works. According to author Michael Ellis, that smooth area you see midway down the worm’s length is where the two worms hook up, create a slimy mass, and release their sperm. There’s more to learn at the link. Link here to the Bay Nature article.
. I’d love to include your success stories and other items of interest with the hiking/backpacking and Camino communities. I encourage you to send them to me at backpack45@yahoo.com for consideration. Emma Gatewood first hiked the entire 2160 mile Appalachian Trail at the age of 67. She last hiked it at the age of 76.